Granite is a material that retains its natural look. It’s eco-friendly as well. The surface is easy to clean and resists bacteria better than other countertop materials. Granite isn’t a porous material, which means that it won’t stain as easily and won’t keep dirt locked in like wood would. If the counter is cracked or chipped, it’s easier to fix than other materials. You can use putty to repair the specific area instead of replacing the entire counter. This repair saves you money that you might not have while retaining the granite counters that you enjoy in the home. 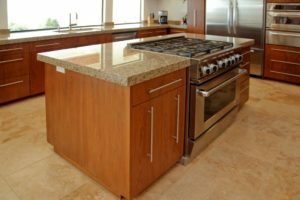 Another benefit is that granite is smooth, which is ideal for cleaning up spills because the liquid won’t move around as much and for preparing meals on the surface.